A beautiful four-floor early 20th century apartment building is being knocked down on Fouad Street at the heart of Alexandria, much to the consternation of inhabitants who have lived through what was arguably the city’s belle époque. Another apartment building overlooking the corniche of Alexandria, in El-Shatby neighbourhood, has also been evacuated in anticipation of a demolition that architectural heritage preservation activists are campaigning against on social media. “I am not sure if the campaign will succeed,” lamented Mohamed Awad, the prominent architect who has dedicated years to the preservation and documentation of the architectural heritage of Alexandria’s city centre. 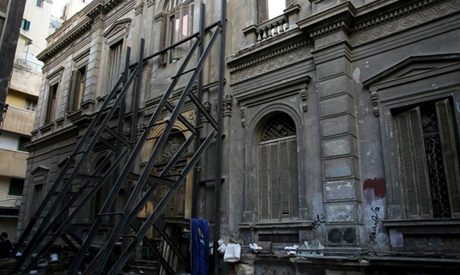 Awad told Ahram Online that the problem is that neither building had ever been put on the list of historic buildings that he helped compose during his days as the head of the Alexandria Preservation Trust (APT). The list includes 1,135 buildings – 33 of which have exquisite architectural decoration – 63 zones, and 38 streets. Fouad Street, at the very heart of the city centre, is obviously on the list. However, in the technical sense, preserving a historic street would not necessarily involve a prohibition on knocking down all its old buildings – especially if the owners of the building manage to provide municipal authorities with a valid reason for the demolition. According to Awad, this reason could be a technical argument, such as fears about the building's possible collapse, or just a "sufficiently convincing argument" that the owner needs to replace a four-floor building that has two apartments on each floor with a higher structure that can accommodate more apartments. Since he started his work as head of the APT over 40 years ago, Awad has seen the demolition of numerous historic buildings in Alexandria, notable for their architectural value, the events they witnessed or the inhabitants they had accommodated. Awad also grieves over the fate of the Villa Cicurel, which was demolished in 2015 and carried the name of one of the most prominent Jewish families of early 20th century Egypt, who owned an elegant department store chain. The villa was constructed in the early 1930s by two prominent French architects; Leon Azema and Jacques Hardy. “These are just two examples, but we have seen other historic buildings demolished despite being included on the preservation list and despite elementary court rulings [against the demolition],” Awad said. Awad says that this brings up one of the key challenges facing preservation efforts in Alexandria: drafting new legislation and observing existing regulations. “I am convinced that we need much firmer regulations on this matter; and we also need to see specialised courts dedicated to examining cases challenging the demolition of historic buildings,” he said. “Realistically speaking, especially if we are talking about keeping the style of the city centre, we need to think about renovation for modern use,” Awad asserted. One renovation option that Awad says has been working well in Alexandria is the lease or purchase of buildings by construction companies that turn the interiors into restaurants, cafes and art galleries. “Reuse is a very successful option that has been undertaken in many world capitals that have considerable architectural heritage to preserve,” Awad said. He says this reuse could include turning apartment buildings into hotels or hotel apartments, or to redesign the interiors of apartment buildings to create more apartments. The problem with such mega projects, however, is that they require considerable funds, and given the declining economic and cultural attention to Alexandria, the resources needed have not been available in the city. “We have seen some of this attention, of course, but we need much more if we are to preserve the city centre's style – because as I said, we have lost a lot and there is a lack of strong regulations prohibiting the demolitions,” he argues. Awad says that an “absolutely necessary” step is creating interest in historical Alexandria. Awad's architectural firm – Awad Associates – is looking to gain support from the European Commission for a project centred on preserving the museum of 19th century Greek Alexandrian poet Constantine Cavafy. The project would also include preserving many of the city's other cultural attractions, including museums, theatres, music venues, cinemas, art galleries, literature outlets and gastronomy venues. However, Awad believes that even with the needed support, the project alone would not be enough. He says that the problem of demolition would persist if no new avenues are made available. “There is a truly developmental problem here, and resolving this problem is essential for the cause of preservation,” he said. Awad’s forth point is about the city's horizontal expansion. Awad argues that the lack of visually artistic quality is a feature of the numerous state construction projects implemented in recent years, including hotels erected along the corniche as well as the new fly-over built on the corniche "for no architectural reason whatsoever." Awad – who in 2002 entrusted the Bibliotheca Alexandrina with photos, manuscripts and maps for the exhibition of ‘Impressions of Alexandria: The Awad Collection' – fears the looming loss of the aesthetic nature of Alexandria’s city centre and the “diminishing culture of beauty” in a city that used to be one of the most beautiful harbours of the Mediterranean.